Well, it looks like they have arrived. Millennials are generally the children of Baby Boomers and were born between the mid-1980s and late 1990s. They now represent 24 percent of the total U.S. population—a larger percentage than Baby Boomers—and spend about $200 billion every year. Millennials represent a significant buying force and, to stay relevant, brands must account for this generation’s needs, purchase preferences, and increasing spending power. In fact, one-quarter of the Millennial population has an income greater than $75K a year. Building brand momentum with Millennials requires an understanding of the key trends and what matters to this generation. 1. Brand story and mission matters to Millennials. Millennials look for a few key value propositions: authenticity, originality, and value. For example, they are 38 percent more likely to buy natural and organic products and 40 percent more likely to shop local, even if it costs more. Your brand story must convey why your brand is unique, special, and worth their attention—all in six seconds. 2. Top brands among Millennials are relatively new to the market. While top choices for Boomers and Generation X include more established brands with a history of consistently delivering on their brand promise, the top choices for Millennials include newer brands with a strong value proposition. 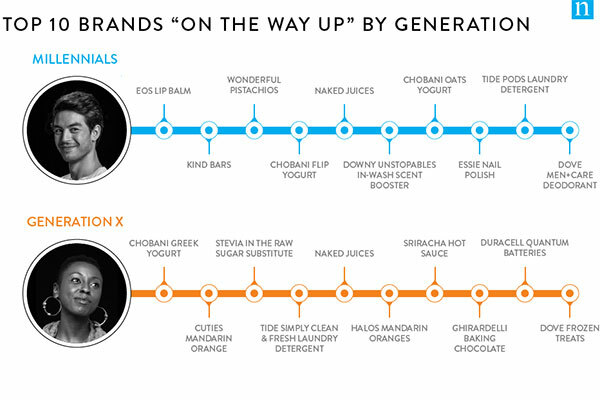 According to the 28th annual Harris Poll EquiTrend® study released by Nielsen, newer brands such as Kind bars and Naked juices have been able to build momentum with Millennials successfully. 3. Multicultural is now mainstream. 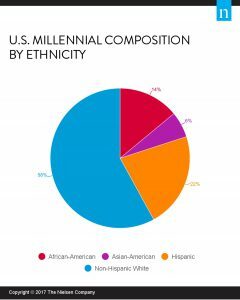 More than 40 percent of the Millennial population is considered multicultural, defined as having African-American, Asian-American, or Hispanic heritage. This group takes extra steps to maintain a connection with their culture, meaning that brands must tell a story that connects to the values of multicultural Millennials. Among the context to connect with this group, sports, photography, fashion, and food industries have been the most successful. 4. Millennials are tech-savvy and trusting. Compared to all other generations, they are most trusting of almost every type of advertising—digital and traditional—and technology is an integral part of their shopping experience. Retailers can entice Millennials with digital deals and coupons that are customized based on location, previous purchases, or holiday. Although they make less shopping trips than Baby Boomers, Millennials spend more per trip—$54 versus $45. The Millennial generation and the rise of digital, omnichannel marketing have shattered the standard, more predictable path to purchase. Connecting with younger consumers requires an innovative approach to the overall customer experience and, more importantly, telling your brand story in a way that makes them the hero. A compelling brand story engages and delights consumers; it makes them want to learn more, want to participate, and want to advocate on a brand’s behalf. 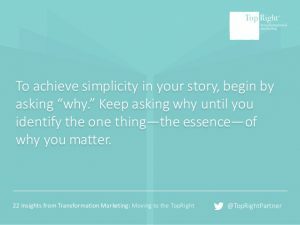 Learn how to architect a 6-second story that drives business growth – download our latest ebook, Transformational Marketing: Moving to the TopRight. Follow @TopRightPartner and click here to subscribe to our blog.